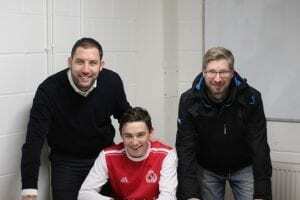 We are delighted to announce that we have signed Lewis Sivewright on a dual contract from our youth set up. Lewis has been training with the first team squad and been part of match day squad and was on the bench against Scone and Whitburn. Lewis is seen signing the paperwork this evening, overlooked by Phil McGuire.